With the wisp of the whipping wind, fall is blowing into the tents of Dodge. Over the last couple of weeks dodge has seen one leaf at a time switch from the bright green to the bright reds and yellows. As quickly as leafs have blown off the trees the leaders have vacated their tents. The last week rolls through and tents are torn down and quiet is falling over the facility. The last week of crews out of dodge has left us with one teen crew and one adult crew, a nice calm week of crews to finish out summer. With the final shipment of crews out a big sigh of relaxation has falling over the staff. 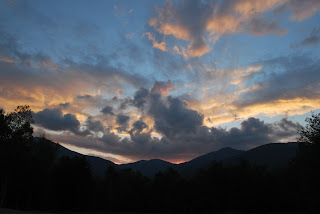 Over the course of the summer, many have referenced what we do as being like a ship crew, stuck in the close quarters of the White Mountain national forest to sail across the trails with crew upon crew being shipped out to provide erosion assistance for the fleet of trails. It has been a very full summer to say the least. As the leaves start to change so does the vibe of Dodge, it is very quiet here now. At nights all that can be heard is babble of the nearby brooks, oh yea and the huffs of the moose hanging in the corn patch. Those lanky guys ate all of our corn recently, major bummer. I guess i should have known that that was bound to happen sooner or later. Recently though, we had another wild group come raging through the garden. 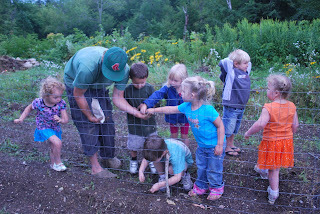 A group of 3 to 4 year olds from the Gorham community center come out and learn and help about in the garden. We picked potato bugs, planted spinach and peas and harvested carrots, a whole whopping 12 pounds. After picking them and cleaning the carrots, the little ones passed the big bag around so they could pick up and see how much weight they actually picked from the ground. I must say for me 12 pounds pretty light, but for these little ones it was about a 4th of what they weighed. I must say they were mighty proud to hold those carrots. Entering September means a hush for dodge on all normal circumstances but this year with the bridge wash out it is even quitter. No cars can drive up and there are no flies out of here. All that is left is myself and the researcher, Mac. We are left with the occasional caretaker that rolls on through. Beyond that, it is just the two of us. A little weird I must admit to have a whole 5 acres of national forest basically to ourselves. With the peace though I am actually able to get some projects done that otherwise would not happen, for when there are people, there are issues and I play band aid for anything that might arise. In this final couple of weeks for dodge the only thing that demands lots of attention from us is final volunteer barbecue. It is a time where women and men of all ages can gather and share the stories of the summers work on the trail. We gather support from the local communities to give out prizes to those who put there time and effort into the management of the trails. This years BBQ was different then most years. As many know by now, we have restricted access to the bridge, the stupid storm Irene has really put a thorn in my side. The bridge has been undermined and it is not possible for us to drive any vehicles back onto the property. For the BBQ we had to shuttle all out visitors from the Diritisma trail head next to pinkhum, from there all visitors had walk from the road up the hill and to the facility. Before the hurricane there was expected to be about 120 people or so. With the bridge crash we dropped down to 80+, still a solid turn out for all the change in logistics. People were still thrilled to come and eat all the delicious food. Special thanks to our cooks, Jess Wilson, George Dixon, and Pat McCabe. There tireless effort fed this banquet and then some. We had so much extra great food we had a chow down for all residence of Admin the next night and then can a bunch of side dishes to a huts end of season gathering. The garden did its part for the year and allowed us to have lots of fresh veggies added into the mix. Right before this event I made sure this place was clean to the “T”. With that being said, a highlight of this whole BBQ was we only produced three bags of trash. Why is this so important, well one, I had to lug only three bags over the bridge into my truck and two our waste was very minimal, most things were fresh and did not come with plastic wrapping, and we recycled as much as we could. For an even with that many people 3 bag of trash is small in my eyes. Next year I think we can have only two! The community that can revolve around conservation and food is vast and unexplored, people of dodge are pioneers, I solute you.